NS Class 1600 electric locomotive of the Dutch Railways. Can be used on all types of Lego ® track.The roof can be opened and both driver seats can be taken out to accommodate the engine with a driver. The set does not include the Power Function parts. Power Function set is optional. Stickers with the names & crests of the Dutch cities <?xml:namespace prefix = "st1" />Amsterdam (engine 1601), 's-Hertogenbosch (1608), Emmen (1711), Enkhuizen (1711), Lelystad (1834) and Groningen (1838) are included. 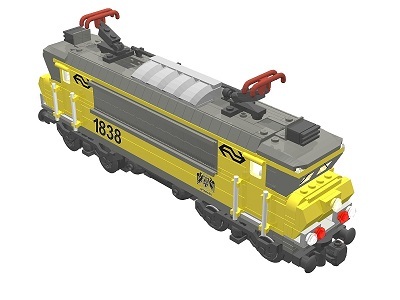 Also available as 9V or RC version at BrickExpress. The 4 printed bricks are included with the instructions. Also available as RC version and 9V version at BrickExpress.